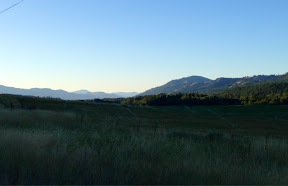 The early morning ride down the Methow valley was quite nice. The town of Winthrop is all decked out in old west attire, touristy, but nice. This was the big day over Rainy and Washington Passes. The climb started right away but then eased up for a while. Now that I was past the hydro-electric stuff the scenery was much more beautiful. Got an early start, out by 7:15. Low clouds and cool. Second breakfast in Sedro Woolley. South Skagit highway to Concrete. Nice low traffic road but there was some road work going on and a bunch of gravel trucks. The Skagit river is quite a bit bigger than the Willamette and a lovely aqua green color. Also very fast moving. Got out by 7:50. The sun was already shining and it was warming up quickly. The ride to Marblemount was on a very quiet back road. Very pleasant. Had to beg for wi-fi at the Buffalo Inn so I could text Linda. After Marblemount the road got narrower and more uphill and soon entered the NP. It would have been nice except for the power lines. Newhalem a.k.a. Seattle City of Light is home to a huge hydro electric plant and the people who work there. It's actually quite nice with lots of trees and a park. After this the road got steeper, and the sun got hotter.